More like Ocean’s Eleven than The Martian but still a 4 star read! 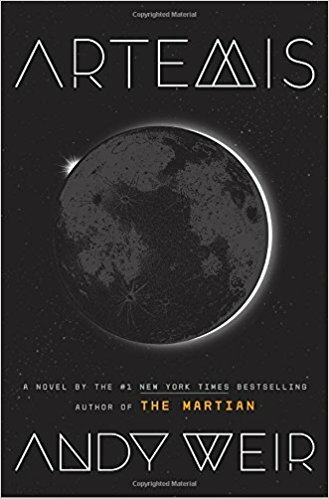 The only similarity between Artemis and The Martian is the main character’s inventive use of science to solve their problems. Jazz is a smuggler on Artemis, the sole city on the moon. She is whip smart but just wants to get rich quick with minimal work. When an opportunity presents itself, Jazz is in. Jazz needs to use all her resources including her intelligence to complete her well-paying scam. The planning and execution of Jazz’ plan is fascinating due to the use of real science to achieve her goal. Jazz is a great character that feels genuinely different for a caper plot. Some of the science is enthralling–reusable condoms, gizmo Apple Pay/iPad knockoffs, remote-controlled HIB climbing spiders, etc. Overall, a great read for caper fans and a good read for everyone else. 4 stars! Thanks to the publisher, Crown Books, and NetGalley for a review copy.